Electronics Costs > How Much Does a Metal Detector Cost? How Much Does a Metal Detector Cost? A metal detector is an electronic device that can respond to metal that is not detectable by the human eye. Using an oscillator, the metal detector will produce a current that can measure metallic objects. Invented in the early 1960s, a metal detector can detect things such as weapons, coins, jewelry or anything else made of a metal-like material. They are commonly used on beaches where people check for lost jewelry and money, and it can also be used by historians to find artifacts and other things of value. The cost of one is going to depend on the brand, the type, features and where it’s purchased from. The cost of one is going to depend on the brand, the type, features and where it’s purchased from. On average, a metal detector can cost anywhere from as little as $45 for one built for kids to as much as $1,500 for professionals. A common hobby metal detector that is used by amateurs can cost $45 to $250, while an advanced setup can cost anywhere from $900 to $1,500. 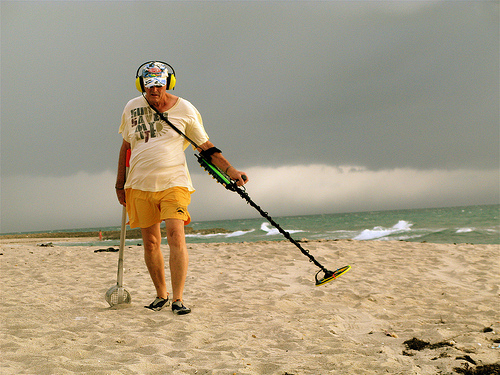 An underwater metal detector will cost anywhere from $200 to as much as $1,500. A kid’s metal detector can cost $15 to $100, and these detectors will usually be on the lower end and meant to be used for entertainment value. At Walmart, for instance, their metal detectors can cost anywhere from $60 to more than $210. Refer to our table below to see what most popular brands cost. All metal detectors will have a coil that measures a certain diameter, and common diameter measurements include four, six, and eight inches. Running on a wireless nine-volt battery, a simple switch can be turned on, and once metal is detected, the indicator will detect with a frequency telling you how deep the metal is and even what type of object it may be. This will depend on the model. There are two common types of search coils: concentric and DD. A concentric coil will have a metal ring inside of another and will emit a cone-shaped search field about as wide as the coil itself. As mentioned in the first point, if the coil were to be eight inches wide, then the search field depth would be about eight inches as well. The DD coil will resemble two Ds facing each other, projecting a blade-shaped search field that’s usually three inches wide and 11 inches tall. Compared to a concentric coil, the DD coil will be thinner and will be able to identify only one metal at a time, making it easier to spot certain objects. Major brands will come with a limited warranty that can last upwards of five years and protects it from general defects. Since most metal detectors are wireless, alkaline batteries will be required. Most detectors will require a nine-volt battery. Attachments such as headphones can help you hear sounds when in a noisy place or assist those who are hard of hearing. Headphones can start at $15. Other metal detecting accessories include a sand scoop and a pinpointer, a device that pinpoints the exact location of the buried metal. While optional, a carrying bag can protect the metal detector from damage when transporting. Some may come with a bag. Larger coils can be purchased for some specific models, and these coils will allow you to reach a larger range while using it. Additional study materials such as books and DVDs on how to find specific metals can start at $5. For example, the popular book Metal Detecting for the Beginner retails for $9 to $13. Know how you’re going to search with this detector. Searching for gold is going to be a lot different than searching for some sort of relic. The size is going to matter. When purchasing a detector with a smaller coil, these can tend to be more sensitive to objects around while a larger coil can search deeper into the ground, but for larger objects only. Highly consider purchasing a used/refurbished metal detector if purchasing a detector that is over the price of $300. Used ones on sites such as Craigslist and eBay can commonly be purchased for less than 50% of the retail price. Higher end metal detectors can be rented at some rental companies. If you’re thinking about buying one or simply want to try one, see if you can rent one for the day.